The Thursday Interview: Michael Schutz-Ryan. 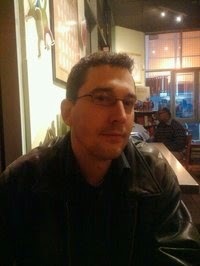 Today I'd like to welcome Michael Schutz-Ryan, author of “Blood Vengeance” to The Thursday Interview. Before we get started, a quick intro! Michael was born and raised in the frozen tundra of Wisconsin. He attended the UW-Stevens Point and graduated with an English degree from the Madison campus. A lifelong diet of Ray Bradbury and Stephen King whet his appetite for the macabre. A lover of all things horror, he likes to plumb the depths of Netflix in search of scary movies. He lives in San Jose with his husband and the enduring spirit of their cat, Catie. 1) Would you break the law to save a loved one? Why? I certainly would. I think it’s more important to follow a moral imperative than mankind’s laws. I’d steal that loaf of bread to feed my family. And I’d protect the physical safety of someone I love. Keep in mind that I read a lot of dark fiction, watch a lot of violent movies. I’m just looking for an excuse! 2) What is the difference between being alive and truly living? To truly live, you have to follow your dreams. They don’t have to big, expansive dreams, either. And there’s no reason to jump out of a plane to feel alive. Be a good husband, a great mother. Throw fabulous dinner parties. Just be happy in your pursuits. Then you’ll really be living. 3) What motivates you to write? The voices in my head. They never shut up. They’re always asking: “Ooh, what if that happened? What would you do next?” From there, I love to create characters—breathe the initial life into them and watch them take over. I love telling stories. And I try to convey a deeper meaning of the world along with the chills and thrills. 4) Why do humans want children? Beats me! The instinctual need to procreate? The quest for immortality? I’m happy with my furry children—my three cats. I want them around because of the unconditional love we give each other. It’s this huge emotional commitment—and payoff, these little creatures that need me to care for them, and then give their trust and love in return. 5) What was the biggest challenge in creating your book, Blood Vengeance? The process of rewriting and editing was monumental. I wrote the rough draft by hand, filling five notebooks over nine months. Typing all that onto my computer just to have a workable draft was daunting! As my longest work up to that point, I had no idea how many new ideas and twists I would want to add…and then need to go back through the entire manuscript to reflect those changes. 6) What is the most important thing you have learned in life so far? How to be at peace with myself. It’s no secret that I’m a recovering alcoholic; I seem to have been addicted to “more” my whole life. More booze, more food, more love, more attention. The past several years have been about slowing down, and putting things into perspective. 7) How did you come up with the title “Blood Vengeance”? My short story titles come so easily, but this one was a difficult birth. I tried out a few and decided I needed something splashy. 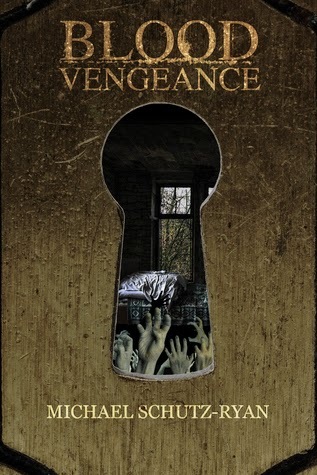 There are a few different types of “blood” and “vengeance” in the book, and depending on how you look at it, the book could be about the overt horror or about Brennan Cooper’s quest for acceptance. 8) How do you handle personal criticism? I smile and act polite. But inside, it tears me up. I think there’s an assumption that artists (writers, painters, actors, any breed of artist) should have tough skin if they’re going to put their work out there. I’d argue that if artists had tough skin, they’d be unable to tap into the tender, personal, scary parts of their psyches, their lives, their minds, needed to produce their work. Releasing that work for public consumption leaves one vulnerable. Taking harsh words with that proverbial grain of salt—or facing the truth of a bad review—is a learned process. I’m still learning. 9) Why should people read your book? To be entertained. It’s a horror novel, after all. There are scares in Blood Vengeance, disturbing images and themes. But this is a coming-of-age story, too, and I’ve tried to present a sense of loneliness, sorrow, and redemption. I like to tell stories. I hope people like the ones I tell. 10) Why is there something rather than nothing? What’s the point if there’s nothing? The world would be a stark, lonely, sad place. If you have to make your mind up one way or another, why would you choose nothing? Hope is something. Love is something. Ghosts and witches and demons are something, too, and I believe in them as much as their angelic counterparts. Thank you Michael for taking the time to answer my questions & the best of luck with your new book! Sick of being bullied, seventeen-year-old Brennan Cooper packs up for San Francisco to start over. But before he can settle into his new home, Bren is drawn to the abandoned apartment downstairs. In its shabby rooms, he sees the grey and rotting ghosts of murdered girls claw each other in sick imitation of their deaths.. Now time is running out, not just for Brennan and his friends, but for the spirits of the girls trapped for all those years with their murderer. Great interview, Michael. Some of your answers were remarkably similar to mine from November 27th last year. Great minds think alike, I suppose. Well done sir, and best wishes for success with all your writing and publications! Terrific interview! These are some very insightful questions, and great answers. Thank you, K.R. I had lots of fun with this!